The opposite wall represents episodes from the lives of Saint Brigid and Saint Patrick. 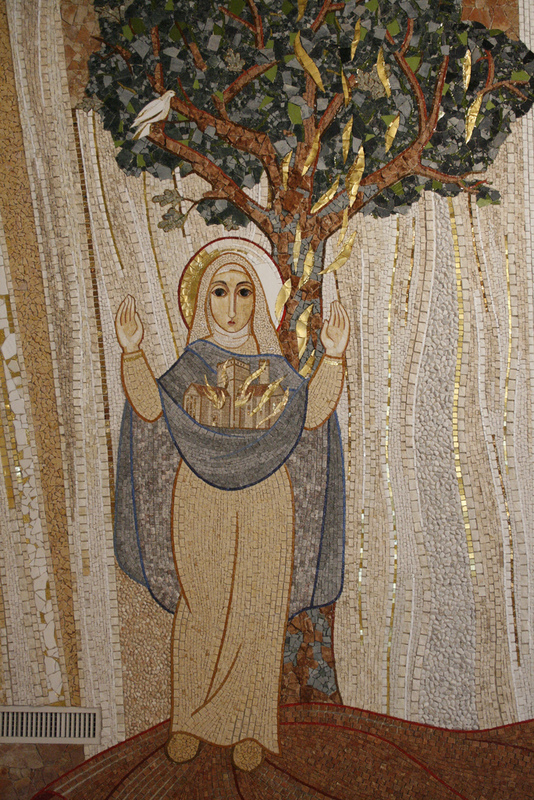 Brigid founded her church at Kildare, a name which means the ‘church of the oak tree.’ The Irish College now stands on Rome’s Coelian Hill, the ancient Mons Querquetulanus or ‘the hill of the oak grove.’ The oak tree in the mosaic links these two places with a common name: it recalls Brigid’s evangelical zeal at Kildare and it expresses the hope that it might take firm root among us again. The dove perched in the oak tree has a double purpose. It symbolizes Saint Columba (Columba is Latin word for dove), Ireland’s secondary patron, who went from his native Doire/Derry, meaning “the place of the oak-wood”, to found a monastery on the island of Iona. The dove also reminds us that the chapel was reordered during a time of long prayed-for peace on our island. The cloak at Brigid’s feet recalls another story associated with the saint. Brigid went to the local chieftain to ask for land on which she could build her church, a convent and a hospice for the poor. The chieftain initially refused Brigid’s request but, because of her persistence, he subsequently agreed to give her the land that she could cover with her cloak. According to tradition, Brigid placed her cloak on the ground and it miraculously extended to cover the large area that is now known as the Curragh of Kildare. There Brigid made her foundation and so was able to express her all-consuming love for God in her hospitality to the stranger and her care for the poor.